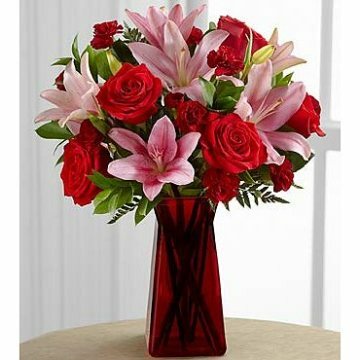 The Love Rushes In™ Bouquet by FTD® is a warm expression of your most heart-filled desires. Brilliant red roses, pink Asiatic lilies, burgundy mini carnations and lush greens are gorgeously arranged in a ruby square glass vase, making this bouquet a gift that displays your most romantic intentions. Deluxe bouquet includes 11 stems. Approximately 17"H x 14"W.
Premium bouquet includes 14 stems. Approximately 18"H x 15"W.